The very first entry of the wine list I was reading began “On Draft, Pale Sherry” To come across Sherry on draft in New York City may not be too surprising these days. It was just in the summer of 2011 that Ashley Parker wrote about the Gotham Project in the article Partners Push a Tap Wine Manifesto. The wine list of the Metropolitan Hotel at 162 Pearl Street also includes a Madeira and Port on draft which seems like a natural extension to just white and red wines on tap. However, before you start searching online please realize that this wine list is 150 years old. Metropolitan Wines. July 27, 1859. Image from What’s on the menu? NYPL. The three draft selections detailed for Wednesday, July 27, 1859, include Pale Sherry, London Particular Madeira, and London Dock Port. All of these wines were priced at $1.00 per pint and $1.50 per quart. They were the cheapest wines for each section where the prices topped out at $5.00 per quart both for 30 year old brown Sherry and 1835 Fine old St. Anna Madeira. I must admit I was taken aback by visions of a pre-Civil War bartender dispensing wine by pulling a handle. Wine has been dispensed from cask or racked into bottles and pitchers for quite some time. However, the term “on draft” or “on draught” appears to be quite specific and different than the Old Pedro Madeira “on tap” in 1811. Serving beer on draft through a beer engine has 17th century origins. In the effort to determine if wine “on draft” had the same implications as for beer this post takes a look at other period advertisements, books, and menus. Device for raising beer and other beverages. 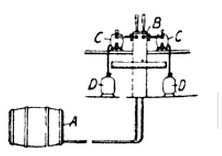 Image from Patents for Inventions. 1898. Google Books. One early advertisement from July 2, 1772, indicates that Blanchard’s Wine Cellar in Boston served “Very Old choice Sterling Madeira, in Bottles or on Draft.” On May 23, 1793, “Cider on draft and bottled” was available in Charleston, South Carolina. That very same month, also in Charleston, A. Jones sold “Train Oil, In casks or on draft” for making Indigo. Henry Calwell, jun. & Co. sold gin on draft, cases, and in jugs and James Murphy had Teneriffe wine on draft and in bottles. The indication is that “on draft” implied a variable volume, perhaps in the customer’s own container, and not a fixed volume such as a bottle or cask. It also did not imply any specific serving method of device. 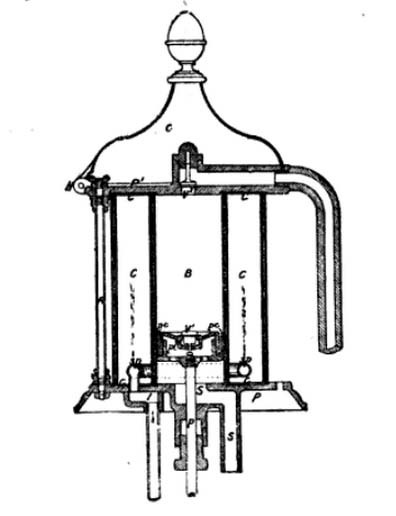 The variable volume definition is clearly born out in later advertisements such as at Snider’s in Philadelphia where various wines were “on draught by the gallon or wholesale by the cask.” This seems reasonable given that casks held several dozen gallons of wine and might be too much for someone without a cellar or thirsty appetite. Packing for Pistons of Beer Engine. 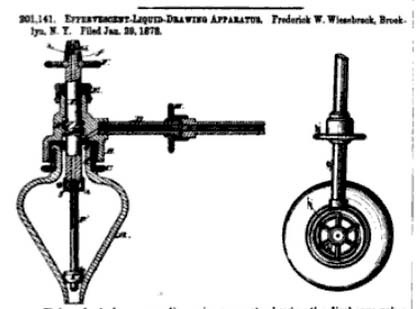 Image from Patents for Inventions. 1896. Google Books. No other drinks were served on draft at the Metropolitan Hotel. Even the beer was served by the pint or quart. In fact very few 19th century menus list any drinks on draft. 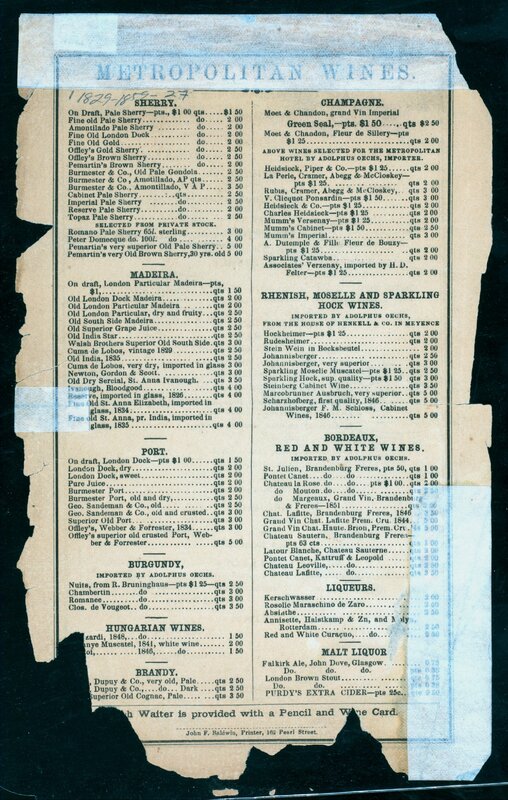 One other example is the 1865 menu of Parker House, Boston, which lists beer both by the bottle and “on draught.” We may never know how the draft selections were served at the Metropolitan Hotel. But we do know Champagne was served on draft in 1835 and 1836 and that inventors were patenting engines to dispense wine. The possibility that somewhere else in the 19th century wine was served by pulling a handle remains intriguing.